Book Description: This book argues that the best way to understand the stories of the Old and New Testaments is to consider them as human stories with sophisticated narrative techniques at play. God is a character in these stories from the beginning, and considering god as a character in a narrative proves fruitful in responding to the human voices of these stories. CHAPTER 2 - WHAT IS THE BIBLE? Chapter 6: "Who should I say that you are?" Chapter 11: "Who do they say that I am?" Although many readers go to the Bible to find the revealed word of Yahweh or of the Christian God, what they find there is always an interpretation of the text through the filters of a religious dogma which exists prior to the reading of the text. Reading the Bible suggests another way of reading the texts, a way of reading which concentrates not on “what does it mean?” but on “what does it say?” and “what do I see there?” The result is a fresh approach to the reading of these biblical texts, an approach which celebrates human storytelling while investigating myth, language, and the act of reading a text. 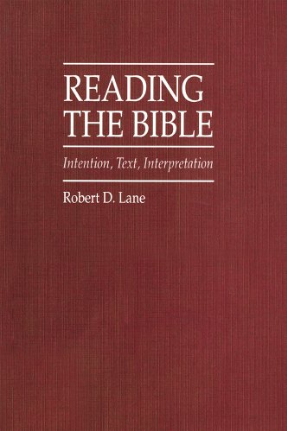 Reading the Bible: Intention, Text, Interpretation by Robert D. Lane is licensed under a Creative Commons Attribution-NonCommercial 4.0 International License, except where otherwise noted.